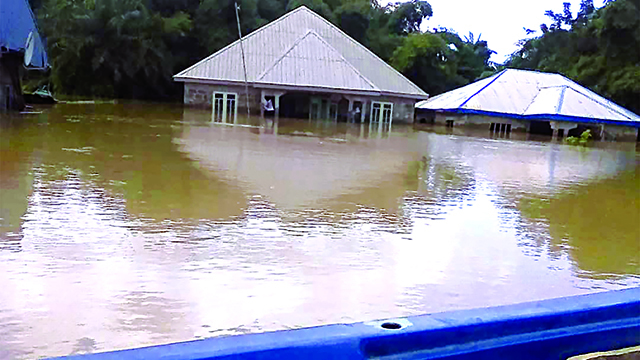 No fewer than 1,000 flood victims from the four local government areas in Orashi coastal region of Rivers State yesterday attempted to occupy Government House, Port Harcourt over alleged neglect by the state government. The protesters who hailed from Ogba/Egbema/Ndoni, Ahoada East, Ahoada West and Abua/Odua local government areas were displaced by flood two months ago. It was learnt that some of the victims now sleep under bridges, flyovers, markets, motor parks and other backwater places. The Guardian learnt that the victims do not also have access to healthcare, potable water, market and food items, as everything in the coastal area have been submerged in flood. Pained by their pitiable condition, they vowed to occupy government house until the state government attended to their needs. The protesters were, however, denied access to the Government House, as over 20 police officers deployed to Azikiwe Road, forced them to stop at the UTC Junction, which is about three minutes drive to the Brick House. The victims carried their stoves, traveling bags, mats, beds and placards with inscriptions as, We Have Cried But Not Heard; We Have Been Displaced But Not Accommodated; Our Houses Have Been Destroyed, But Not Rebuilt; We Have Lost Lives But Not Consoled, and We Have Been Hungry, But Not Fed. One of the victims, Michael Nnadi, said it was disheartening to know that Governor Nyesom Wike donated N200 million to Benue flood victims but abandoned his own people. Rivers State Chairman of the Civil Society Organisations (CSOs), Enefa Georgewill, condemned the conduct of the police. But in its reaction, Commissioner for Information and Communication, Emma Okah, blamed the Federal Government for alleged discrimination in handling flood issues across the country.